WASHINGTON – The U.S. State Department says TransCanada’s proposed Keystone XL pipeline poses no major risks to the environment and will not spur further oilsands production in Alberta, moving the controversial project one step further to a final decision by the Obama administration. Insisting repeatedly that its long-awaited assessment was “not a rubberstamp,” the department’s Kerri-Ann Jones said Friday there’s no evidence the pipeline will significantly impact the six U.S. states in its path as it carries crude from northern Alberta to Gulf Coast refineries in Texas. “This is not the rubberstamp for this project,” said Jones, disputing several big American environmental groups who immediately decried it as such. The outcome wasn’t a surprise to the American environmental movement, for whom opposition to the pipeline has become a passionate rallying cry in the aftermath of failed climate change legislation last year. “We feel that the proposed route of the applicant is the preferred route … alternative routes were either worse or similar,” she said. The NRDC’s Susan Casey-Lefkowitz expressed dismay at the State Department’s assessment in a statement. “It is utterly beyond me how the administration can claim the pipeline will have ‘no significant impacts’ if they haven’t bothered to do in-depth studies around the issues of contention,” she said. Jim Lyon, senior vice-president of the National Wildlife Federation, said the analysis was “strike 3 for the State Department” after two “failed rounds” of environmental review and warned of legal woes ahead. Environmental activists say Keystone XL is a disaster waiting to happen, pointing to several recent spills along pipelines, and are opposed to Alberta’s oilsands due to the high levels of greenhouse gas emissions involved in their production. “Support for Keystone XL continues to grow because the public, opinion leaders and elected officials can see the clear benefits that this pipeline will deliver to Americans,” he said in a news release. 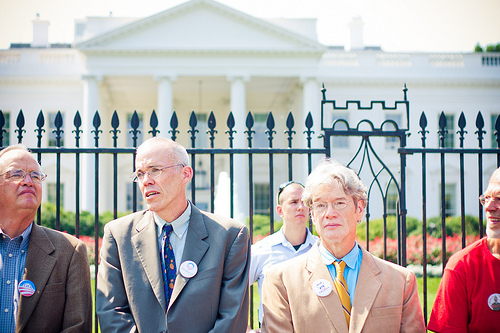 On the first day of a planned two-week sit in at the White House organized by TarSandsAction over 70 people were arrested including one of the lead organizers organizer Bill McKibben. barrels of dirty oil from the Alberta Tar Sands to Texas refineries. August 29th with religious leaders. serious about climate change and protecting the future of young people.Do they deserve a second chance? Yes, everybody deserves a second chance. dead-on course to climate collapse. What can be done? described in the paper “The Case for Young People and Nature”.Until the public demands otherwise, the policy makers will continue to serve their financiers. politicians who do not look beyond their next election. coal mining, hydro-fracking, deep ocean and Arctic exploration, etc.). will be effective in dissuading others from attending? Posted by rogerhollander in Canada, Democracy, Environment. The recent bad news about climate change thundered through the scientific community like those twisters through the U.S.
First, the International Energy Association (IEA) announced global greenhouse gas emissions hit record highs in 2010, threatening to catapult Earth over the 2C rise in temperature that, scientists predict, will lead to cataclysmic changes. We’re already up one degree, attributed to human causes. That’s enough to cause widespread drought, wildfires, flooding, extreme weather — and shrinkage of the polar ice caps. The other climate bombshell came when the U.S. government’s Earth Systems Research Laboratory announced that this year world greenhouse gas emissions are climbing even higher than last year. On a per-capita basis, Canada has much to answer for. Population and economic growth, oil and gas exports and our love of light trucks have been among the key drivers of our rising emissions. 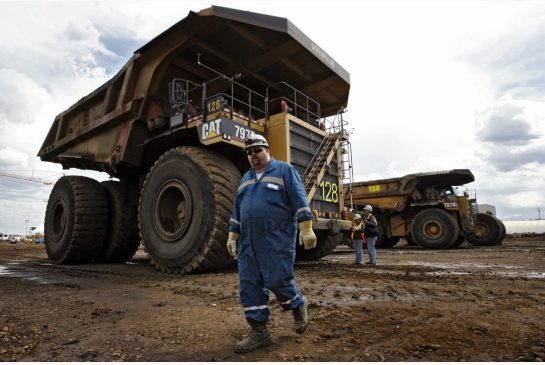 Then there’s Alberta oilsands mining, which, according to Environment Canada, spews more greenhouse gases than all the cars on our roads combined. Earlier this month, the government quietly tabled its annual report on how Canada is doing in meeting its targets under the Kyoto Protocol and other international obligations. It isn’t, not by a long shot, say critics. “Unfortunately, far too many are in denial and political action is at a standstill,” observes Kevin Trenberth, Distinguished Senior Scientist at the Boulder, Colo.-based National Center for Atmospheric Research. “Once the problem is so obvious to everyone, it is far, far too late to do anything about it,” says Trenberth. That sense of urgency is why a growing number of scientists are advocating non-violent civil disobedience to shake up governments, industry and media. Although there is some political disagreement, the general scientific consensus is that in order to head off mass extinctions, huge migrations of climate refugees and, yes, global warring, carbon dioxide emissions should be cut back to 350 parts per million from the current 390 or so. “Non-violent civil disobedience is justified when there is a history of long-standing harm or violation of people’s fundamental rights, when legal and policy means have failed to reduce the harms and violations, and when there is little time remaining to address the problems,” wrote University of New England professor John Lemons and Penn State’s Donald Brown in April in the online version of Ethics in Science and Environmental Politics. “Simply put, people do not have the right to harm others who have not given their consent to be harmed, and this is exactly what the U.S.A. and other countries continue to do,” Lemons told the Star. 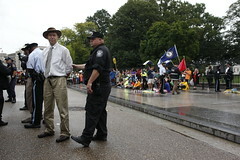 Environmental activists have long engaged in civil disobedience. Greenpeace, to name one group, has specialized in it. In 2009, 20 activists were arrested after they scaled Parliament’s West Block and covered it with banners demanding government action on climate change. On June 2, two members were arrested and removed from an “Arctic survival pod” suspended from an oil rig off the coast of Greenland in which they had camped out for four days in an effort to stop a Scottish oil firm from drilling. Noted Australian climate advocate Clive Hamilton (Affluenza: When Too Much is Never Enough, Requiem for a Species: Why We Resist The Truth About Climate Change) insists that the moral obligation to act now clearly trumps obedience to the law. “Those who engage in civil disobedience are usually the most law-abiding citizens — those who have most regard for the social interest and the keenest understanding of the democratic process,” he emails from Britain, where he is a visiting professor at Oxford. Civil disobedience has a proud tradition. It helped bring about civil rights in the U.S. and an end to the Vietnam War. It delayed mass logging in B.C.’s Clayoquot Sound. African-Americans boycotted and defiantly drank out of “whites-only” water fountains, young men burned their draft cards, and thousands blockaded roads to keep pulp and paper companies out of old-growth forests. The member-supported Council of Canadians has engaged in all sorts of civil disobedience, including sandbagging towns and provincial legislatures to point out how rising sea levels would affect them. “It’s not an action to be taken lightly,” says Andrea Harden-Donahue, the Council’s energy and climate justice campaigner. “We do believe that all other democratic means should be pursued first and continue to be pursued, even with a civil disobedience strategy. Most lawmakers — and even most people — don’t seem to think much of the tactic. Witness police actions against non-violent stunts such as teddy bear catapults at global summits, or citizen complaints of tied-up traffic during demonstrations. How many Canadians say that last year’s peaceful protesters at the Toronto G20 Summit should have just stayed home if they didn’t want to be tackled, cuffed with plastic cables and tossed into cages without charges. One much talked-about recent case of civil disobedience within the scientific community is that of NASA climatologist and Columbia University professor James Hansen, who along with others was charged with obstructing police and impeding traffic in West Virginia while protesting mountaintop coal mining. Hansen, who calls climate change “the great moral challenge of this century,” has been helping other activists who get into legal trouble, including six Greenpeace members tried in Britain in 2008 for scaling and painting slogans on a coal power station’s smokestack. With Hansen’s expert testimony, they convinced the court that, despite the expensive havoc they wreaked, even greater damage — climate change — was being prevented. The acquittals shocked both government and industry. The activists were found not guilty by reason of “lawful excuse” — a judgment that opens the door for more climate justice civil disobedience. In Canada, we have a similar “defence of necessity.” Conceivably, it could be used here. More than 3,000 delegates from 183 countries are currently in the midst of the two-week session of the United Nations Framework Convention on Climate Change (UNFCCC) in Bonn. The reports from there have not been encouraging. The world’s 21 developed nations have not fulfilled their promises or financial pledges to the parts of the world that will most suffer from climate change. Antonia Zerbisias is a columnist for the Toronto Star. In addition to her Star columns, you can read Antonia – and talk back to her – on her blog Broadsides.